Bowl 2015 will take place on February 1, 2015 in Arizona. The Super Bowl XLIX game will be played in the University of Phoenix Stadium in Glendale. NBC is broadcasting the Super Bowl 2015 and will have sold out most or all of its Super Bowl ad inventory despite the new record $4.5 million price-tag for a 30 second commercial. Back in early November NBC already had sold out 90%, which was slower than Fox last year, but still they managed to fill the available slots for the Super Bowl 2015. 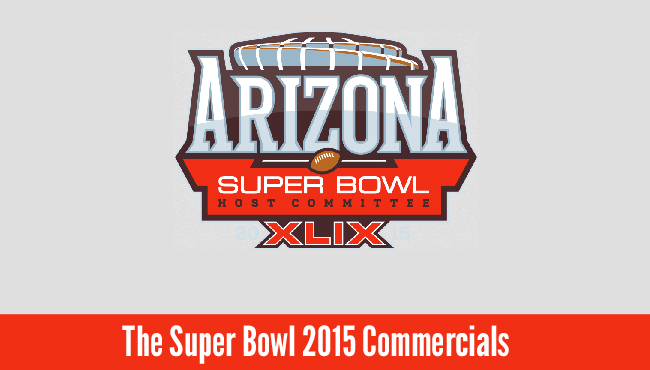 We have updated Super Bowl 2015 Ads Line-Up with all 2015 Super Bowl Ads news there is. There are so far 17 Super Bowl 2015 advertisers we are tracking in our Super Bowl Ads list. Over the last couple days no new Super Bowl Ad related news has been released and nothing new has leaked. The latest was the announcement of the Carnival Super Bowl 2015 and the leak of the Budweiser Super Bowl 2015 ad, which will again star a dog. We already have a list of Celebrities that will appear in Super Bowl 2015 ads that includes Matt Damon and Danica Patrick. Starting January 5, 2015 Super Bowl Advertisers will start pushing out more information about their planned Super Bowl 2015 commercials creating a big wave of Super Bowl 2015 Ad news and teasers. Early January also marks the kick-off of social media campaigns supporting the Super Bowl ads reaching up to the Big Game. The Doritos Crash the Super Bowl 2015 ad voting will also launch in January. Visit our Super Bowl 2015 Ads section for the latest Super Bowl news.